Holla! I’m a day late posting, but hopefully this update won’t be a dolla’ short. If you’ve been reading for more than a few days you are probably aware that I’ve been redoing the kids’ bathroom. Yes, another bathroom post. I’m on a roll (pun unintentionally hilarious). So, let’s see, where was I? 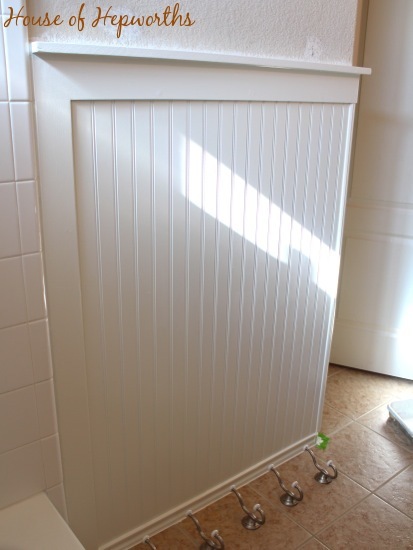 I started with a moodboard of the big overhaul, then the bathroom got all up in its business with some serious beadboard treatment, and after that the ugly builder-grade mirror got a handmade (but not homemade – that sounds frumpy) frame. Which brings us to today. Hardware. And paint. And [insert something else here that sounds cool]. Oh my. I needed 3 items to make the phrase work, but I only have two updates, so just make something up. Let’s see… I started by painting the heck out of all the new moulding stuff. I used a semi-gloss in a Sherwin Williams color called Alabaster. I have this color color-matched to no less than five different brands of paint, and I think the lucky bathroom winner winner chicken dinner was my True Value can (because it’s in semi-gloss). Before I painted I spent a day caulking all the seams and filling all the nail holes with wood filler. To really make the nail holes seamless I lightly sanded them after the wood putty dried. And then of course is the mirror that I showed you Friday. It’s all caulked and painted and shiny and pretty. 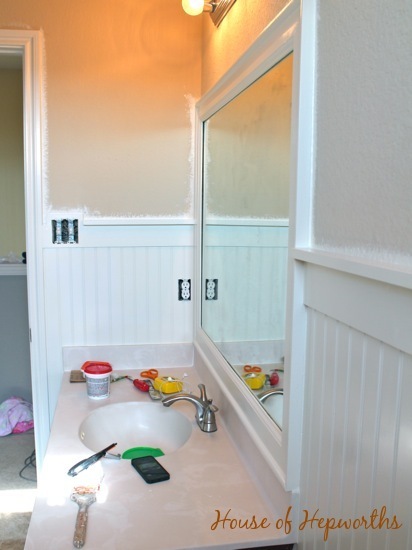 In this picture you can see the side of the mirror and how it connects to the beadboard. Just in case you are like me and like to study every nook and cranny of a project before you replicate it. So, a guy walks into a bar. Or rather, I walk into someone’s house. Most people look around and think it’s pretty and then just enjoy the company. Me? I start looking at how the moulding meets in the corners, and how chair rail connects to a staircase. And how crown moulding cuts off or ends at the corner of a room. Instead of living in rose-colored glasses, I live in figure-out-how-it-works glasses. I study how the professionals put together a house so that when I get home I can replicate it. If I’m extra-good friends with the homeowner (or I’m at a model home – my favorite! ), I’ll even bust out my camera and take close-ups of all the moulding and corners and edges. I have hundreds of photos of where moulding meets another piece of moulding. Boring to everyone else who sees them, but a gold-mine of knowledge for me. This is how I learn how to do these big DIY projects around my house. I study. I wasn’t born knowing how to hang beadboard, or that I should miter a joint. I did my homework. And I figured it out. Just because you don’t know how to do it doesn’t mean you can’t learn, and study, and figure it out. Before last week, I had never made a frame for a mirror before. This is my first time doing it. You can do it. Just create a plan before you start and then try. If you screw it up? Big deal. Fix it. You will never figure out how to DIY unless you study and then implement. I have screwed up hundreds of times. Caulk hides all mistakes! You will never succeed unless you try. And at least if you fail, at least you can say you tried instead of saying you were too scared. Let’s tackle hardware now. I bought these adorable coat hooks at our local hardware store. Here’s a simple way to hang them, especially if you’ve already painted and don’t want to make marks on your surface. 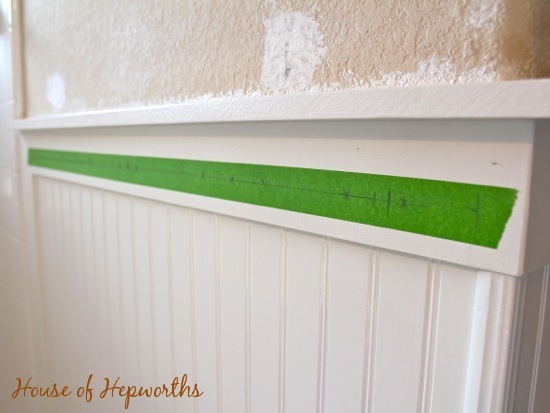 Put a big piece of painter’s tape along your surface, make all your marks on the tape, drill all the holes through your tape, and then rip the tape off when you are done. Now you have all your holes predrilled and are ready to hang your hooks! Brilliant, right? Now just screw in all your hooks. Done. No paint touch-ups needed. 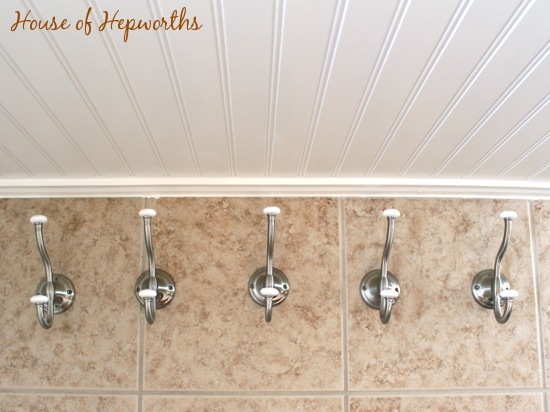 I love the little white knobs on the ends of the hooks. And in case you are wondering why I chose 5 hooks? Well, because I thought 5 looked good. 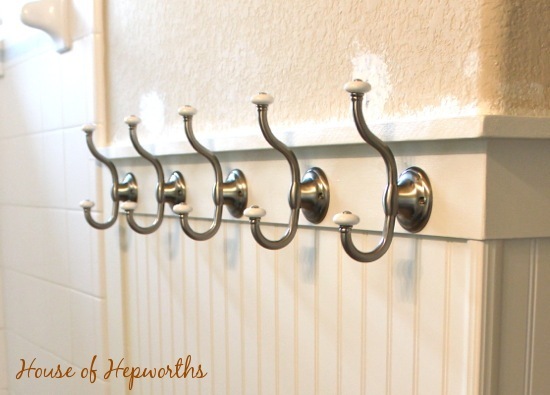 And when you are decorating or hanging hooks or displaying little doo-dads, it usually looks better in an odd number. A group of 3 or 5 looks more pleasing to the eye than 4. I always try to decorate in odds. And I couldn’t choose 3 because it just seemed like not enough hooks for a bathroom. The kids each have a towel and a bathrobe so I needed at least 4 hooks so I bumped it up to 5. I also hung a hand towel ring and a toilet paper holder. 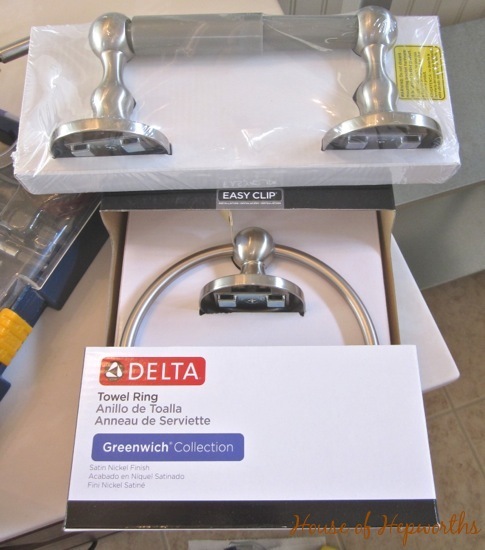 Just because you can buy 15 matching pieces of a bathroom hardware set doesn’t mean you should. I found these at our local hardware store and I could have also bought a matching towel bar in no less than 3 different sizes, a robe hook for the door, a glass shelf, and a bar-of-soap holder that attaches to the wall. That would have been a little over-kill. Just buy what you need! You don’t have to have the full-on matching set. It’s okay to not buy every piece. 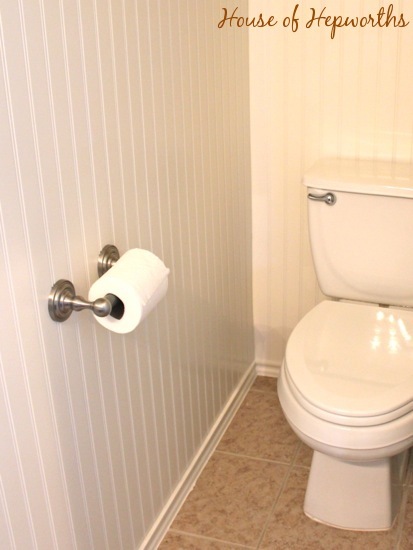 I attached the toilet paper holder to the beadboard and had heart palpitations while doing so. It’s like hanging tile and then drilling a hole into it. You need to drill the hole, but you don’t want to immediately ruin your brand new tile job! It does look pretty on that fresh white beadboard though. 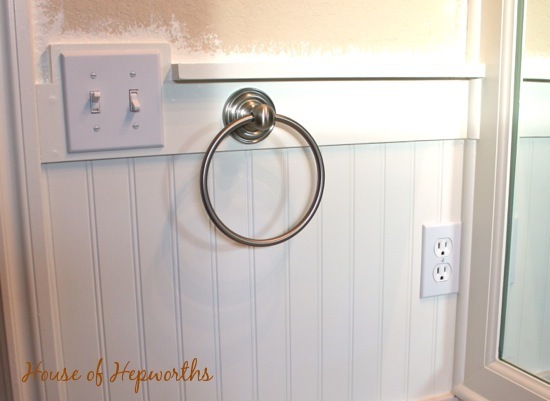 The final piece of hardware, the hand towel ring, I attached to the 4″ board on top of the beadboard. I opted for a ring instead of a hook because it’s easier for the kids to actually keep the towel hanging up instead of them pulling it off a hook and leaving it on the counter. So far so good. Up next? I will paint. I swear. I think I might have a color picked out. I’m going super neutral with a very light gray with a blue undertone. I want to keep the bathroom very neutral and decorate with accessories so I can change it out as the kids grow without having to repaint (I don’t really enjoy painting. I was going to to say I loathe painting, but people tell me I’m too negative, so “don’t really enjoy” is my more positive, passive-agressive way of saying I hate that sh#!). Once the painting is done, I’ll drag in all my accessories, hang some art on the wall, and call it a day. I might make the art myself. We’ll see. I’ll see each of you tomorrow night at my weekly link party! Have a great day. And try adding some sarcasm to your day today. It really makes life so much more fun. (And annoys the fam). Except, I’ve now created two little mini-me snark kings and queens, which I’m sure annoys the heck out of their teachers. Oops. Why be serious when you can roll your eyes instead? ::Famous last words before a forced trip to the principal’s office:: And on that note, I’m out. 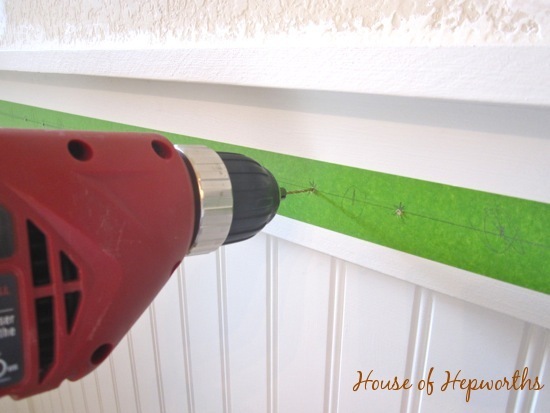 the tape to mark where you drill is amazing, I usually bug hubby and when he never gets to it I just start drilling random holes, true story. You should have seen his face, he was so mad, but he never put off putting something up again. Looks great!! Only thing is you are going to inspire me to finally do something to our bathroom which will mean projects for my husband so he will he saying call her over to help you..lol. Can’t wait to see the finally touches. I’ll have to remember odds when doing stuff. I use to always go with three but now I have four kids so I have been choosing four more but five sounds good in case they have a guest over or for the nights I take a bubble bath in the kids’ bathtub. 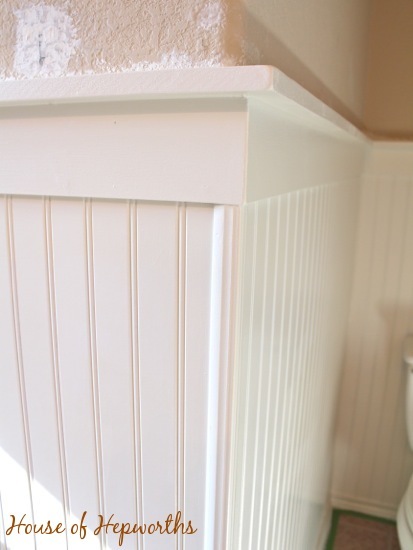 I love beadboard in a bathroom. 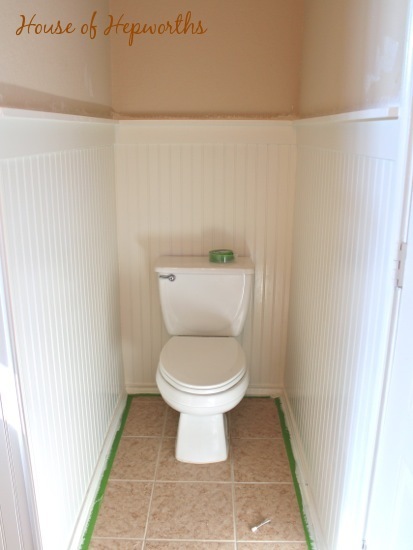 We did our upstairs bathroom with beadboard and it looks wonderful. I love how yours turned out and can’t wait to see what color you put up on the walls. 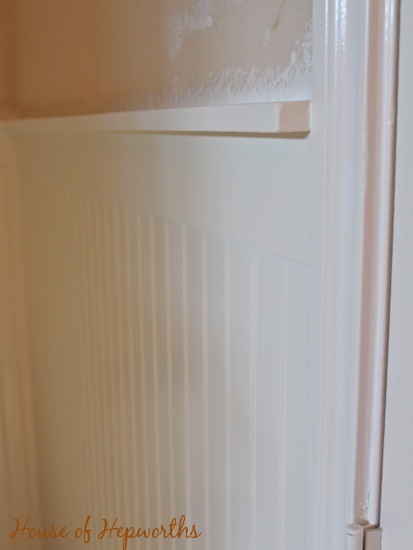 It’s so nice to have a pretty color contrasting with the crisp white of the beadboard and mouldings, isn’t it? I may have to take your advice and frame in my big mirror too…those builder mirrors attached to the wall with little plastic doodads are so unattractive! Silly! My kids’ bathroom (and my own) is on the to-do list this month. I will be re-doing from floor to ceiling! I hope that when I’m finished it, at least, looks half as good as yours! Thanks for the inspiration… and the giggles. I live my life being sarcastic. Ha ha! I do exactly the same thing. In fact, we visited a house today (empty) and while others were oohing and ahhing over the granite and the spice pull outs, I was looking at the trim on the siding to see how it was put on. 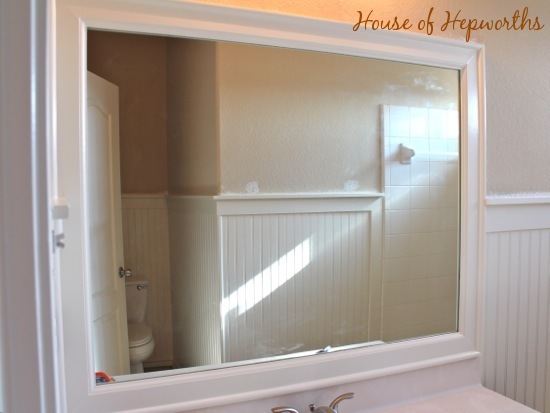 It’s funny you should mention this, because when I saw your first post on this bathroom mirror, I wondered what kind of trim you used on it, if the mirror edge showed from the side, or if you had some kind of picture frame trim. But I didn’t ask because, well, because I didn’t want to be the one not just admiring the finished effect, though I do, it looks great. Your bathroom is coming along beautifully! I’m so in agreement with you that just because you’ve never done it before, doesn’t mean you can’t! Although, I recently met someone who read my blog and pretty much laughed in my face regarding my tiling post. Ah, well, it’s too bad she doesn’t have a sense of humor! I love it! What a great look! The beadboard is absolutely stunning. I love that look – it’s so warm and cottagy and fresh. We installed it in our master ensuite too. I also like where you placed the hooks! They look so neat all lined up in a row. My husband is a Millwork Specialist. Ever in the spirit if Taking Things Too Far Just Because We Can we decided to take a kid ON CRUTCHES and with MONO to The House Of The Seven Gables. Cause hey when life throws you Boston you DO have to do EVERYTHING. Well husband is standing outside the House and examining—read:: Pawing over–the MOLDING on the historic house. Which meant: he was TOUCHING the National Treasure. So of course because he is a man (and because he was with ME who carries her very own Self Destructo Field) the molding FELL OFF the historic 300 year old House. Now of course we are NOT going to “Fess Up” to destroying the place we just bought tickets to go see–so hubs has to now unobtrusevly FIX the molding. Because he IS a Mill Work Specialist (he really ia and has been for lo these 28 years!) he manages to get the molding BACK on the building–after a nice glimpse inside the wall!! !—and we proceeded on Tour. The other good thing about having a kid on crutches and a woman with some pretty interesting mobility issues of ones very own at The House Of The Seven Gables? They will let you go to parts of the House that ARE NOT OPEN TO THE PUBLIC! And use a completely DIFFERENT set of stairs–thereby ensuring that you get to see things NO ONE but the Staff get to see! And hubs “redeemed” himself when he pointed out–thru his vast store of Mill Work Knowledge—that one of their cabinets had a FALSE TOP SECTION on it! He did this by–observing the MOLDING. Pretty cool huh? However if you go there please don’t look too closely at the pics they have at the entrance of the people who are NOT ALLOWED TO TOUCH THE BUILDING. And after all–he USED to be in the toilet paper making industry whereby he used to emerge in restaurants with “samples” of–bathroom paper–and make sure EVERYONE knew whether it met his standards–or not! That was—fun! So now when he pulls over at some strangers house and starts taking pictures of the MOLDINGS or the WINDOWS and DOORS—I just pretend to be very involved with MY phone. All in all a vast step upwards I think! Ok, so I haven’t broken out the camera in someone else’s home…yet. But this is me, too! “I live in figure-out-how-it-works glasses”. So wonderful to here I’m not alone! 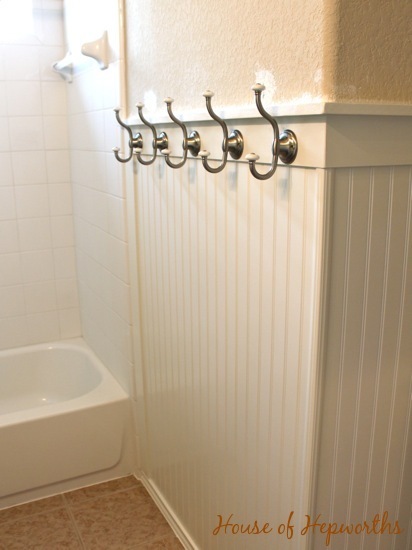 Love the bead board and the hardware you chose! We are in the process of doing a mini revamp (what you are doing is a lot more than a mini revamp in my book)! What, specifically, do you use to caulk the moulding seams? 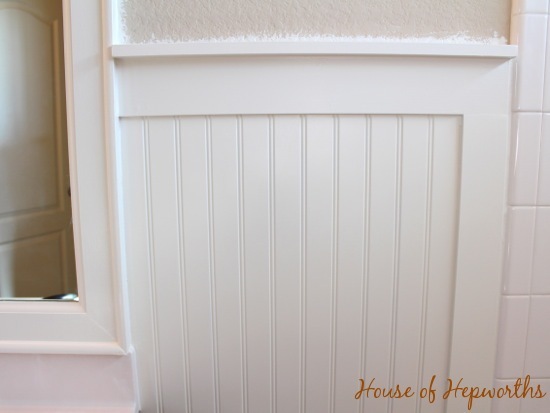 I am getting ready to start replacing all the baseboards in my house and want to make them all bright and purty and seamless. Love the bathroom! One question, how did you adhere the molding to the mirror? I’ve read to use liquid nails however it says right on the tube do not use on mirrors. Help? 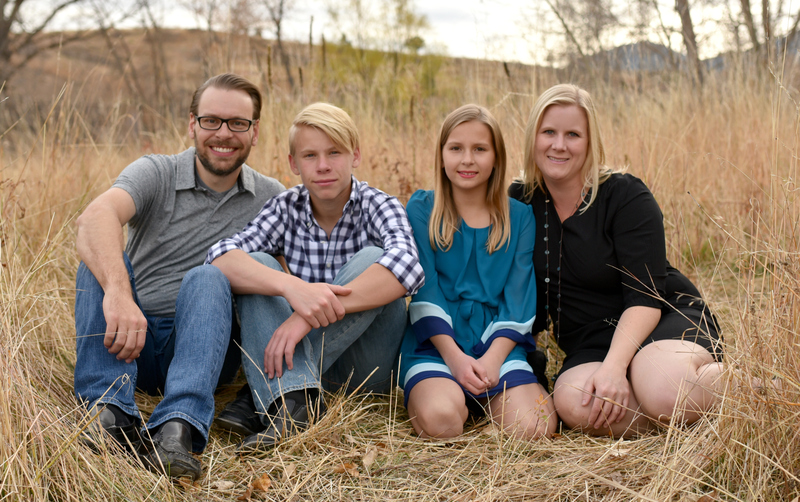 I know you have a son and husband…how do you keep them from “Christening the wainscoating walls? Do you ever wonder how they can miss something as large as a toilet bowl? i absolutely love what you’ve done. I’m trying to convince my husband to consider the headboard (we have a towel bar that keeps coming down, I blame it on 5 kids). His concern is having that much wood in a bathroom that gets steamy. I haven’t researched this further but wondered if you’ve had any issues with steam or water damaging the wood.